½ cup of fresh breadcrumbs. ½ cup of parsley, chopped. Lemon wedges, to serve with. 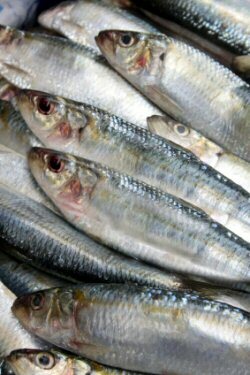 Clean the sardines, rinse well, then pat dry. Melt the butter, then combine with the breadcrumbs, parsley and garlic. Season with salt and black pepper. Stuff the sardines with the mixture and pinch together the opening, roll in seasoned flour and deep-fry in hot vegetable oil for 2-3 minutes. Drain thoroughly and serve with lemon wedges.